The rapid fire of U.S. Food and Drug Administration (FDA) approvals of new treatments for cancer continued last week when palbociclib (Ibrance) was approved for use in combination with the anti-estrogen therapeutic letrozole for treating postmenopausal women with a specific subtype of breast cancer: estrogen receptor-positive, HER2-negative, metastatic breast cancer. Breast cancer cells. Photo by Cecil Fox, National Cancer Institute. Palbociclib is the sixth new anti-cancer treatment approved by the FDA in the past two months. With each approval covering a distinct type of cancer, it is clear that researchers are building broadly from our knowledge of the biology of cancer to identify and develop unique ways to target different cancer types. 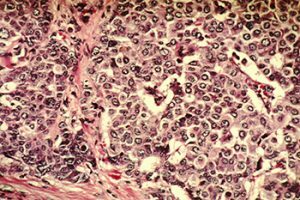 Cancer arises when the orderly processes that control the multiplication and life span of normal cells go awry. Palbociclib is a molecularly targeted therapeutic that blocks the function of two specific proteins that play a role in driving cell multiplication—cyclin-dependent kinase 4 (CDK4) and CDK6. The rationale for testing it as a potential treatment for estrogen receptor-positive, HER2-negative, metastatic breast cancer was based on preclinical research showing that palbociclib synergized with anti-estrogen therapeutics to inhibit the growth of estrogen receptor-positive breast cancer cells. Palbociclib is the first CDK4/6 inhibitor to be approved by the FDA. The agency’s decision, which came more than two months earlier than expected, was based on the final analysis of progression-free survival of the randomized, phase II PALOMA-1 clinical trial. These data were first presented in the opening plenary session of the 2014 AACR Annual Meeting, by Richard S. Finn, MD, an associate professor of medicine at University of California, Los Angeles. 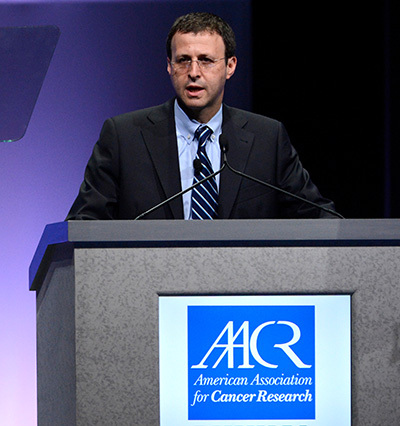 Richard S. Finn, MD, presents data from the PALOMA-1 trial during the AACR Annual Meeting 2014 in San Diego. Briefly, adding palbociclib to letrozole almost doubled the median time to disease progression: Progression-free survival was 20.2 months for those patients who received the combination versus 10.2 months for those who received letrozole alone. Importantly, because the FDA approval is based on progression-free survival data from a phase II study, palbociclib’s manufacturer, Pfizer, is required to conduct clinical trials to verify the clinical benefit of the therapeutic. A phase III clinical trial to do just that—PALOMA-2—is already fully enrolled, with initial data expected before the end of the year. Palbociclib is also being tested in a number of other breast cancer clinical trials and in clinical trials evaluating whether it might be an effective treatment for other types of cancer, including lung cancer, multiple myeloma, and gastrointestinal stromal tumors. In a recent post on this blog, my AACR colleague Shawn Sweeney, PhD, discussed several examples of how the ACCR Annual Meeting has become a showcase for cutting-edge clinical research. The FDA approval of palbociclib based on results first presented at last year’s AACR Annual Meeting provides yet another testament to this, and we are excited to learn about new advances during the upcoming 2015 AACR Annual Meeting.